Yesterday was Klefbom, aka "Dem Abs" birthday and as such I felt this was a good time to look back at the breakout season that Oscar had. The short answer? It was really good. The simple numbers are 82GP 12-26-38. Klefbom was not only the highest scoring defenseman on the team, he was the highest scoring defenseman the Oilers have had since Sheldon Souray scored 53 points during the 08-09 season... let's just forget some of the competition he has had since then. Klefbom's 38 points puts him into the same category for production as players like Ryan Ellis, Oliver Ekman Larsson, Brent Seabrook, and Tyson Barrie. His P/60 of 1.24 puts him ahead of players like Justin Faulk, Cam Fowler, Drew Doughty, and Ryan Suter. That is some good company to be in. While he might not be a right shot, Klefbom has solidified himself as the top PP option for this team. Klefbom's 14 points on the PP has him tied with players like Dougie Hamilton (who played 20 minutes less than Klefbom) and Ekman Larsson, (who played 80 minutes more). Klefbom's jump in production this year comes from a few things. First and most important he was healthy for the entire year which as it turns out makes it easier to produce points. The second was he was shooting lights out. Klefbom shot the puck on net 201 times last season, second on the team was Andrej Sekera with 128. In fact, Klefbom was 9th out of all defensemen last year for shots on net. Another big reason for the success of Klefbom? Adam Larsson. We aren't going to talk Taylor Hall here but I will say the jury is still out on Adam Larsson being a top pairing defenseman. Nevertheless the two players complimented each other. Klefbom's GF60 and GA60 were 2.95 and 2.27 respectively. That changed to 2.25 and 2.95 when Klefbom was apart from Larsson. Of the 1404:49 Klefbom played at evens, 1058:45 of it was spent with Larsson. Based on last season... yes he is. The big asterisk on that statement however is that his 2016-2017 season was the first healthy season of his career. In order for Klefbom to maintain that status and in order for Edmonton to have any success next season Klefom needs to play 75+ games again. I've found HERO Charts to be an easy visual representation to compare players. 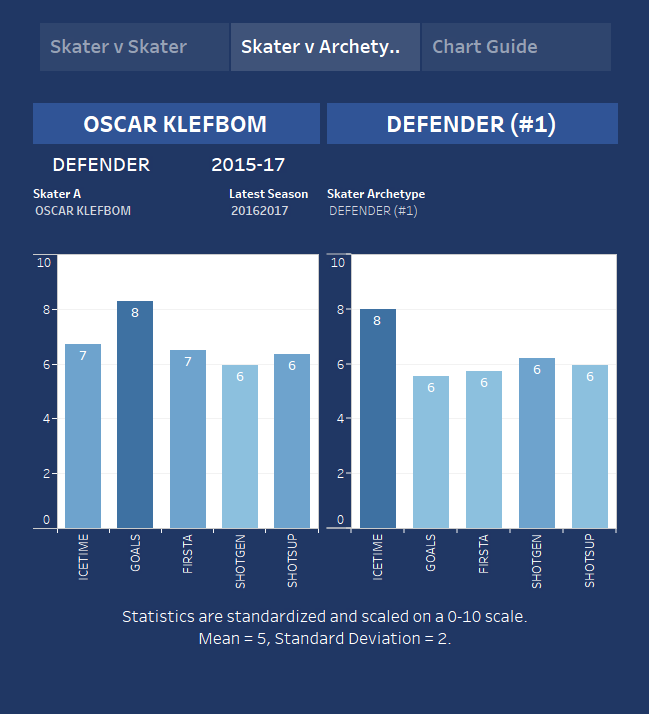 Above you can see Klefbom compared to the average production of a #1 defenseman and he certainly meets the criteria. Klefbom has the most ice time of any Oiler defender, takes the most shots, produces the most, and does all of this while playing against some of the toughest competition. Many things went right for the Oilers last season. In order for this team to move from playoff contender to Cup contender they need players like Klefbom to take the success from last season and build on it. Klefbom proved he could be a #1 last season and has set a high bar for himself. Here's hoping he can meet and surpass the expectations that are now set.